I was missing my husband over Thanksgiving and ended up marathoning the new She-Ra on Netflix. It is wonderful and I highly recommend it, however I have an issue with the portrayal of Entrapta. 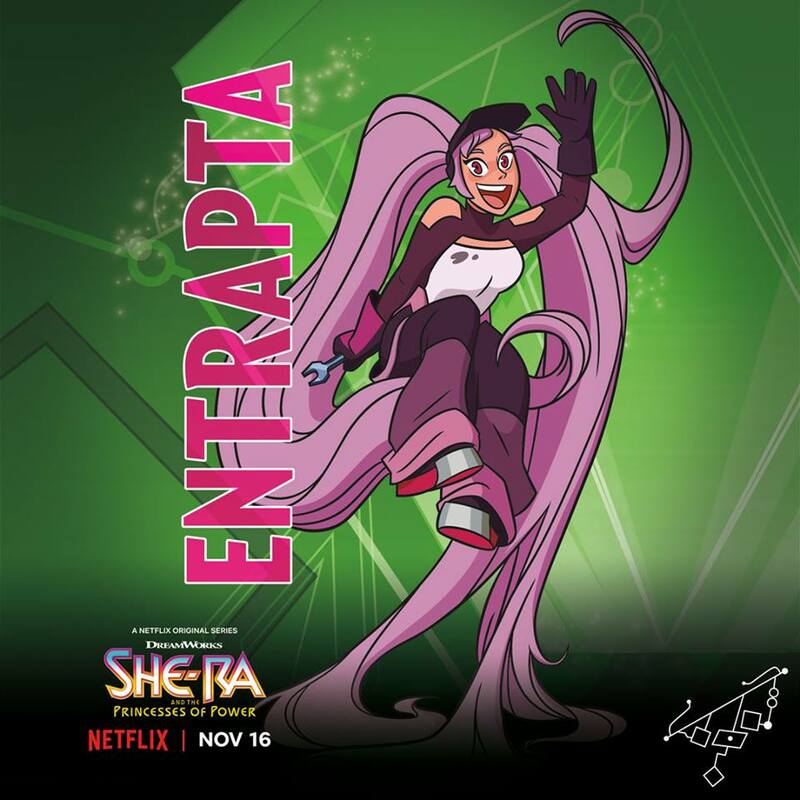 Entrapta was a villain in the original series. The creators of this series chose to make her a member of the "good guys" team first, only to fall to the bad side later after being captured. For a series which is otherwise very good at exploring the motivations of why people (specifically Catra) remain on Team Evil, Entrapta's reasons are... not well fleshed out. She's tricked far too easily into believing her teammates abandoned her on a mission (they thought she was dead) and then enthusiastically builds lethal technology for the Horde because she likes to experiment and doesn't care if her actions lead to people dying. This is a collection of tweets on the subject. Here be spoilers! She-Ra is so good so far and I'm crying at how much I love it, oh my god. Bow is so pure and good and nice and a wonderful example of good masculinity. Glimmer is short and stocky and I stan her so hard. Angella in Bright Moon as a frustrated mom doing her damned best is a mood and I adore her. Every scene with Catra. Every scene. I don't like Entrapta at all and I don't know if it's because I'm neurodiverse (ND) so it hurts that the one ND team mate is basically turned evil because she's too much of a reckless fool to realize that evil is bad, or... what. If I have any criticism of the series so far--and I'm halfway through Episode 12--it would be to point at Entrapta and say "all of that". It's hurtful that the ND princess is too foolish to NOT join Hordak because she's offered cookies. In the prom episode she doesn't even remember what the Horde is and I just. Everyone was yelling "I LOVE ENTRAPTA" at me earlier and I'm sorry but I do NOT. She feels like a collection of parodies and stereotypes about neurodiverse people being foolish and easily confused and laughably simple to lie to. She feels like the Fantasy version of "mentally ill people shouldn't be allowed to own guns" and I just. I'm hoping that Episode 13 gives her a Big Damn Hero moment to reverse all this? Please? Please? 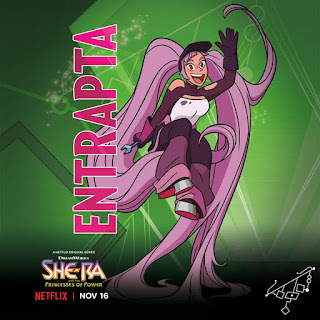 Her fall to evil is frustrating because they did such a good job giving Catra complex reasons for why she stays, but with Entrapta it's just "well, you can't trust neurodiverse people, amiright?" Would it really have been so much to ask that Entrapta be well-rounded and have reasons for joining the Horde other than "neurodiverse people are easily tricked"? I mean, make her a prisoner! Have her join the Horde to save her friends! Give her a complex reason besides making her literally a Fool because she's neurodiverse! Neurodiverse people aren't fools just because we think differently! That's ableism! Well, that was Episode 13. Mermista continues to be the best and I will die on this hill gladly. And, no, Entrapta could've had a Big Damn Hero moment but apparently did not, though I suppose they could retcon that later. sigh. Whatever. *kicks trashcan* That moment would have been when everything seemed lost and they cut to her and the runestone. She could've thrown a switch to route power into the other rune stones. She was alone! There was no-one in the room watching her. It could've been her little Big Damn Hero moment to help her friends without the Horde finding out and killing her. Have her quietly build in a "reverse polarity to other runestones" technojargon button. Bam. Then we could believe that she "joined" the Horde because she knew she was captured and so she tricked Catra into thinking she was a useful fool, but she's still helping her friends from the inside. Which is why I say they might retcon this later and say 'oh, yeah, remember that big battle? Entrapta helped.' and honestly I hope to god they do, but a retcon isn't the same as doing it right the first time. And doing it right the first time would've left the season hanging with WAY more dramatic interest because we'd be anxious FOR Entrapta: she's playing a game of wits and if they find out she's NOT the 'useful fool' she seems, they'll kill her! oh no! I feel like people think I watch stuff looking for things to hate, but I wanted to be wrong about Entrapta. I wanted her to have a Big Damn Hero moment helping the others so we'd know she hadn't REALLY joined the Fantasy Genocide Team out of foolishness. Honestly, "autistic / ND person convinces the NTs that she's a fool but she's really playing them" would be a really NICE plot-twist if done correctly, because it plays on people's ableist assumptions about us. Frankly, that would be MY go-to ploy if caught by neurotypicals: pretend I'm a useful fool and let them "recruit" me, then undermine the entire place from the inside. [Quote from The Problem of Entrapta by Abigail Nussbaum] Basically, Entrapta is so bent on scientific exploration that she deliberately and knowingly conducts an experiment that could potentially have killed countless people, and rendered parts (or all) of Etheria uninhabitable. That's a profound moral failure that can't be blamed on Catra's manipulation, and can't be explained away by pointing to social awkwardness. Simply put, Entrapta doesn't care that her actions are hurting people. This post, yes. "But Catra manipulated Entrapta into joining!" is an excuse which completely fails to understand the problems I have with Entrapta. "Hacking the planet" is her idea, not Catra's. She recklessly and enthusiastically dives into an experiment which will kill people and render parts of the planet uninhabitable, and her lack of empathy is tied to her enthusiastic neurodiverse sciencey self. She is the embodiment of the idea that you can't trust mentally ill and ND people with guns or power or being president or whatever because we're all reckless and foolish and will thoughtlessly hurt someone if we're given the power and capacity to do so. It is impossible to "redeem" Entrapta with a reveal that the Princesses didn't leave her behind on purpose. She has to face her actions and atone--and she's being written in a way which seems to suggest that autistic folks lack that capability to self assess. It's... I don't know the word? Upsetting? Weird? Discombobulating? to see people excuse "joining Team Genocide" and "destroying the planet" as long as it's done by a quirky cute girl. Scorpia is a sympathetic character (her family was captured) but she is still responsible for her actions. She kidnaps someone with every expectation that they'll be eventually killed by her bosses, and she's aiding genocide and murder. She is, in many ways, a foil for Adora: while Adora had a crisis and fled rather than aid the horde, Scorpia knowingly and with her eyes open embraced her new role within the Horde, trading her morals for the security offered to her. She's also the comic relief AND a gorgeous beefcake lesbian, so it's no surprise that the fandom loves her. But it's interesting to see her culpability glossed over. She's not less responsible for her choices than Adora is/was, after all. We have an interesting juxtaposition here, I think, with Kyle who makes this explicit: he doesn't like being Horde but he doesn't see any alternative options. Kyle genuinely is powerless; if he walked away from the Horde, he'd be killed the way Adora nearly was. Entrapta and Scorpia, on the other hand, have the power to survive apart from the Horde, but choose to stay. Incidentally: Several folks have asked whether Entrapta was intended to read as ND or "just" as a socially awkward nerd, and the answer is that it kinda doesn't matter--the damage is the same, regardless. "People who behave like This are dangerous and will kill you" damages us because it affects how people interact with us (and which civil liberties are granted to us) (and how cops engage with us) (and so on). So even if they didn't intend Entrapta to read as autistic or neurodiverse, the overall collection of her personality traits has a high correlation to us, so the portrayal of her fall to villainy needed to be handled with care--and it wasn't. The issue isn't that Entrapta is a villain, so much as how she became a villain. She was turned through a combination of being profoundly foolish and utterly lacking any empathy: two harmful stereotypes about ND folks. ANYWAY. I love the new She-ra and consider it one of the best things I've ever watched AND I want them to handle Entrapta with much more care in the next season. Both/And.